Berkey water filter systems are one of the most popular brands for filtering water in rural areas, at disaster sites, and really anywhere the water is not safe for drinking. With a Berkey system, you can filter rain water, and even water from lakes, rivers, or steams. It’s a top-notch water filter system with laboratory-supported documentation attesting to its quality of performance. The only downside to a Berkey water filter system is it’s price. The 2.5 gallon system averages between $250-$300. While many will say a Berkey is well worth its price, we found another, less expensive, way. Meet Steve. 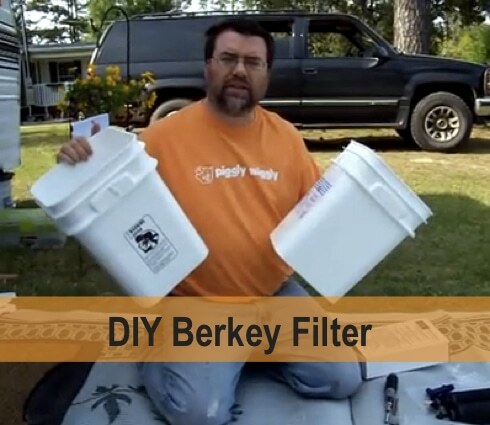 This DIY guy built his own water filter system using the Berkey filters (the part that actually does the water filtering job), but without rest of the Berkey assembly. Instead, he used two 5-gallon (food grade safe) plastic containers and added a tap. Watch the video! You can make your own highly efficient water filter system for about the forth of the cost of a complete Berkey unit.